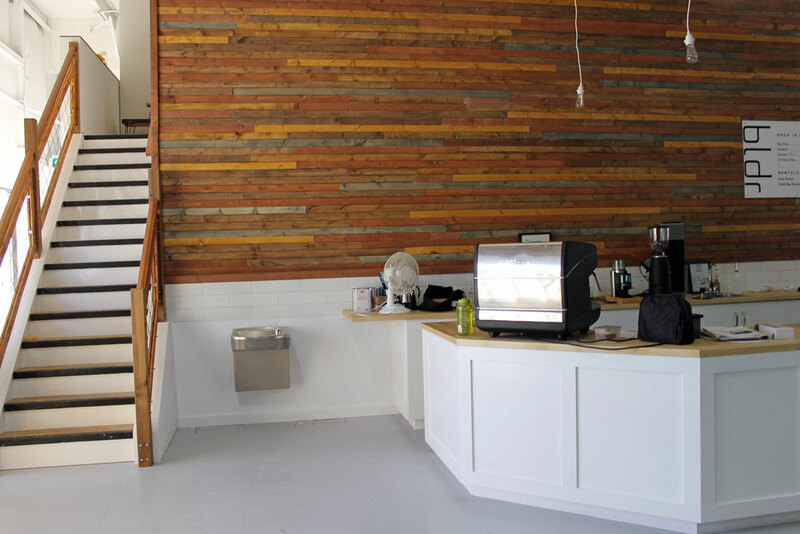 It’s Calgary’s first bouldering specific climbing gym, but it’s also a slick café. 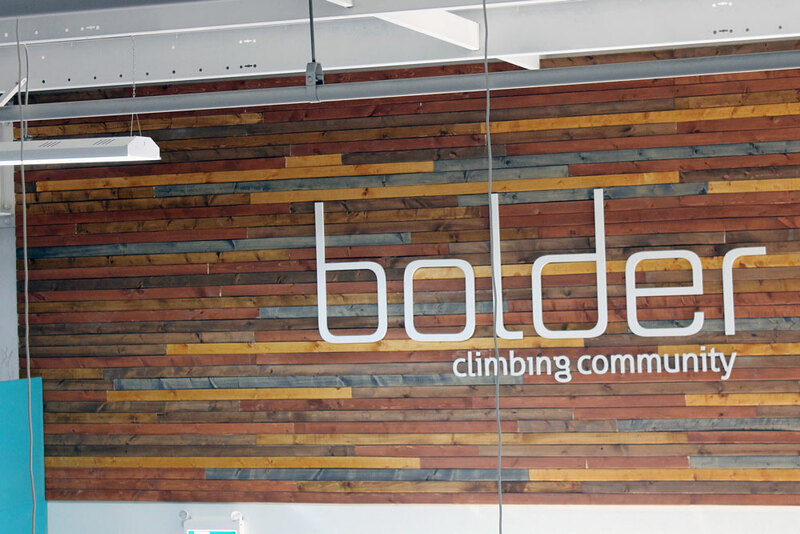 Inside Bolder Climbing Community. All photographs by Karin Olafson. Zak McGurk, Josh Muller and Craig Doram love climbing and they love coffee. And they want you to be able to enjoy those two things together, too. The idea for Bolder all started when Muller and Doram got laid off from their jobs in oil and gas. They took some time to decide what they wanted to do next and quickly decided it would involve bouldering. They recruited McGurk and began working toward opening Bolder. These three guys know what they’re doing – all of them have been climbing since they were kids and all of them have competed at a high level. The space itself is sporty-meets-modern-boutique-coffee-shop. It’s open and colourful and there’s plenty of natural light. There are the bouldering walls, a training wall and weights. But then there’s also a caf, and upstairs, there are couches and a rowing machine. (One day there might be yoga or other events held here.) For now, this upstairs area is a place to unwind or watch the action happening downstairs. 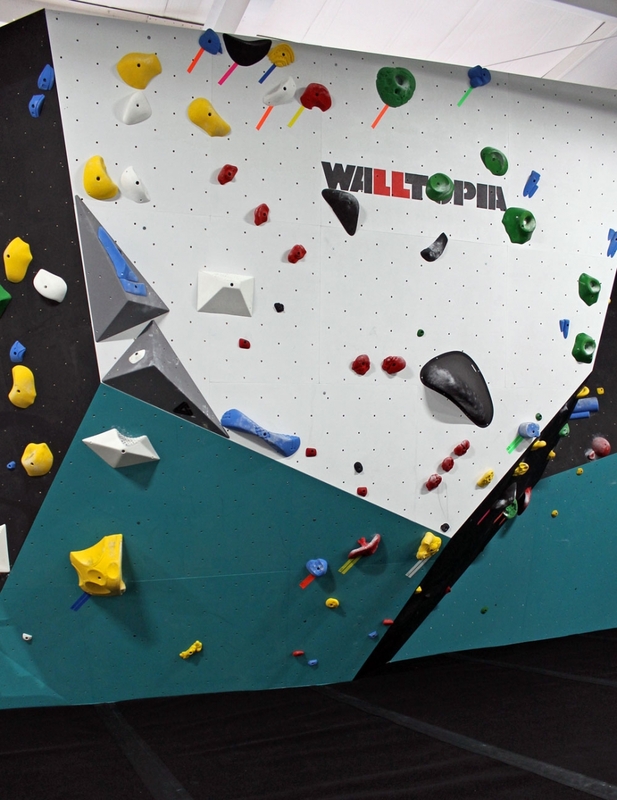 The space itself is 10,000 square feet, but there is 5,300 square feet of dedicated bouldering space. That’s about double the bouldering space that’s in other Calgary climbing gyms. Muller says Bolder can fit up to 50 climbers on the walls at one time, but its capacity is much higher. When bouldering, just as much time – if not more time – is spent resting and hanging out as actually on the wall. The coffee is a made-in-house element of Bolder. Doram has been roasting coffee beans for the last four years and his beans will be available for purchase at Bolder. (The company is called Bolder Coffee Company – the team liked the name so much the gym was named after the coffee company.) There will be a barista on-site making various coffee drinks and hot chocolate, and the hope is that soon snacks will be available for purchase. 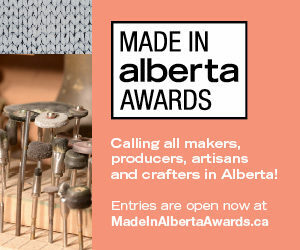 Bolder is different from anywhere else in Calgary in terms of its programming, too. It will offer 30-minute introductory workshops for the total beginners and personalized training programs for climbers with some experience under their belts. Muller, Doram and Regan Kennedy are all Bolder coaches. For more information on Bolder’s hours, programming or rentals, visit bolderclimbing.com. The upstairs mezzanine will be the place to watch athletes training and competing, as you can see down to the entire facility. 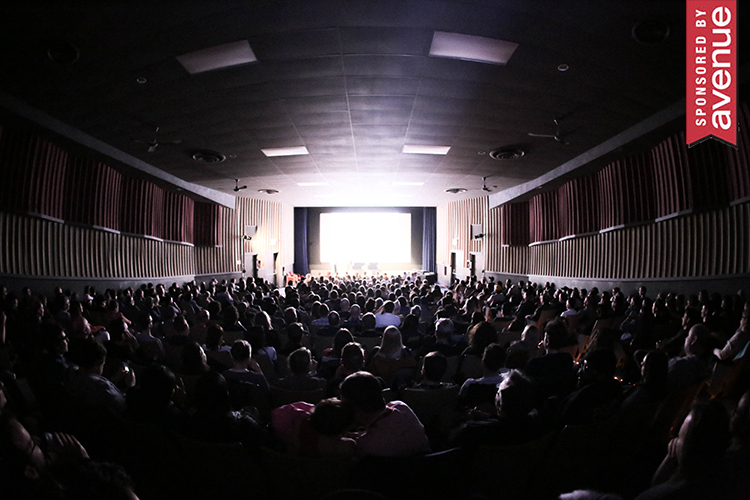 The co-owners say that the 2018 Boulder Provincials will be held here. The gym is bright and open and was designed to have clear lines of sight. There are corridors – those channels without mats – where people when walk when they’re not climbing. Here, visitors are well out of the way of the fall zone and can avoid getting in a climber’s way. Also, the co-owners say that when a space is open like this, it encourages community building and helps build a supportive climbing environment. 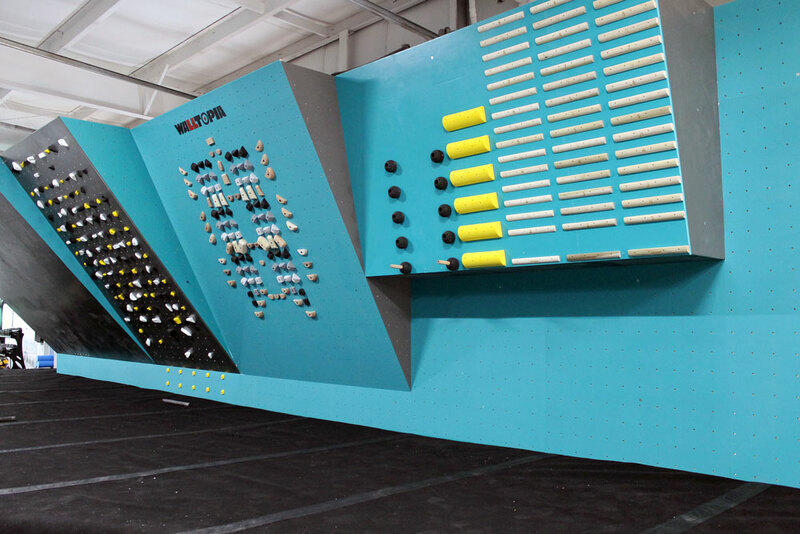 The walls from Walltopia are all 14.5 feet in height – high enough to be thrilling, but not so high that you’ll be in trouble if you fall. The padded floors are by Flashed. The blue and black colour scheme throughout the gym doesn’t just look slick. The team chose dark colours as they won’t show cuff marks as easily, meaning it will look clean and new for longer. 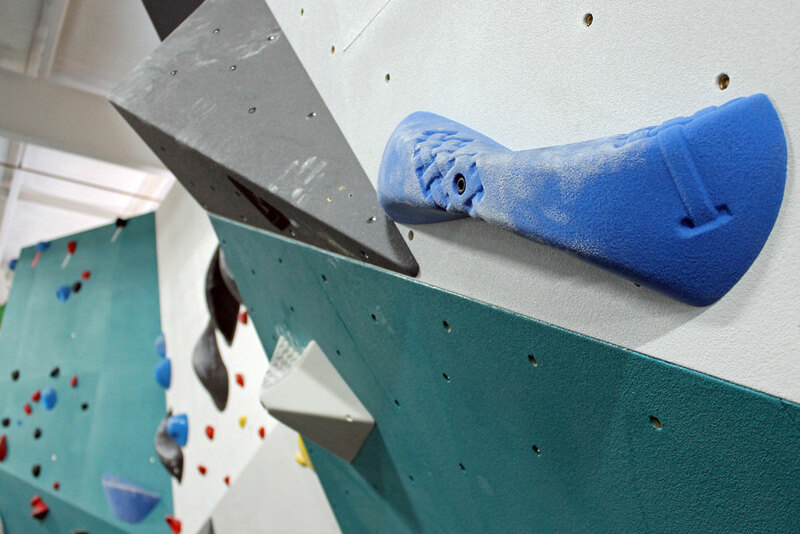 One of Bolder’s co-owners, Zak McGurk, navigates a route on one of the gym’s central walls. The routes range in difficulty, from suitable to the absolute beginner to routes that even the elites will find tricky at first. Bolder uses the V-scale system which is the North American standard for grading. Routes here range in difficulty from V0 up to V17. The route difficulty is marked by the tape colour, and a climber will follow just one colour of holds all the way to the top of the wall. 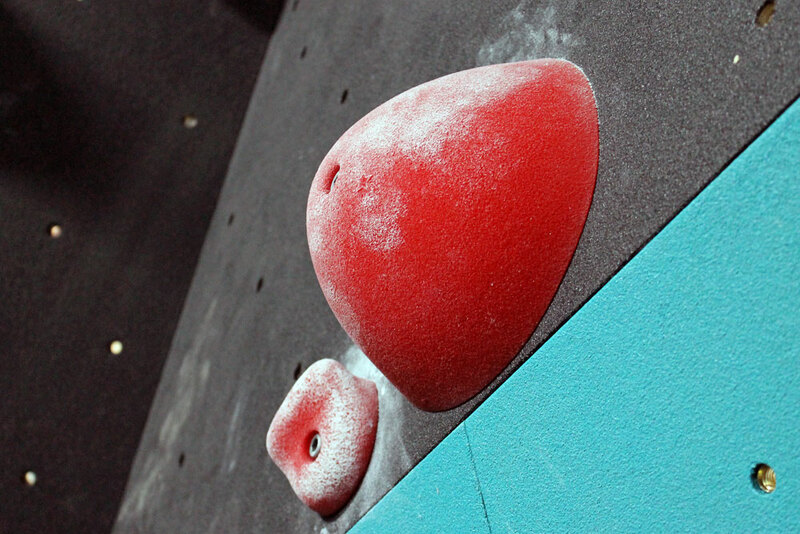 McGurk says there will be about 30 new bouldering problems set up each week. 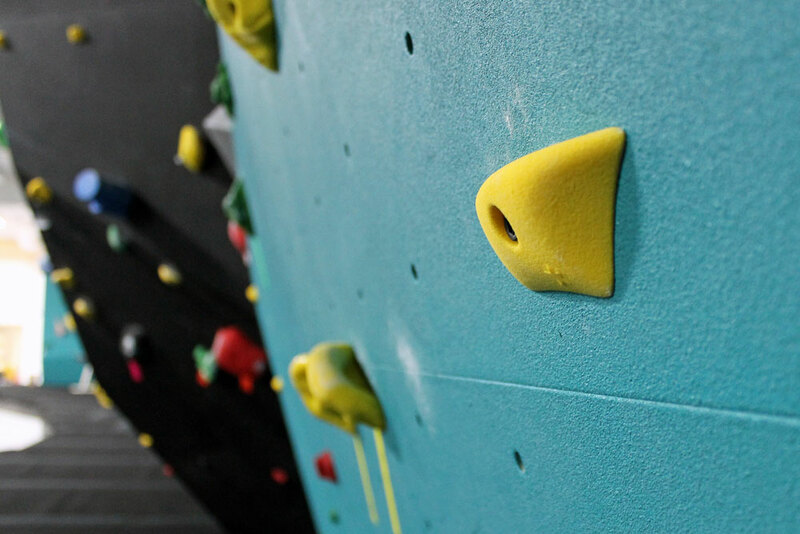 The training wall is designed to make climbers with some experience even stronger. 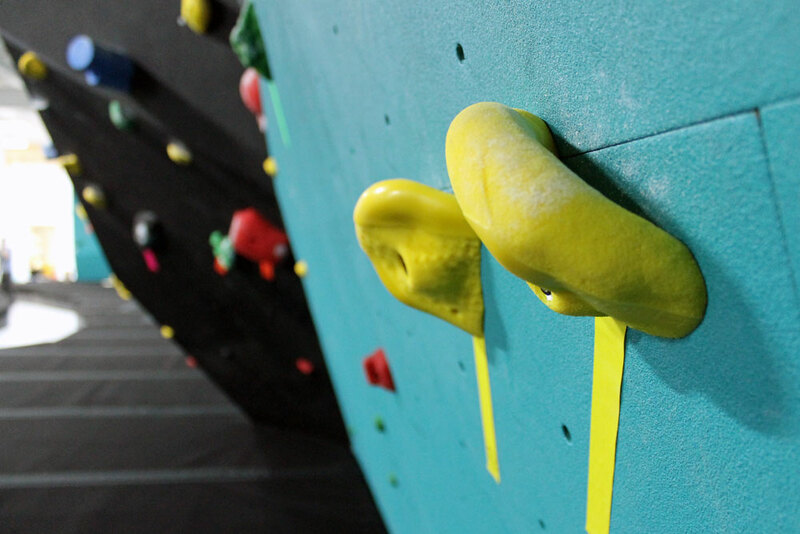 There’s a MoonBoard (far left) and there are additional elements that work on a climber’s grip strength and upper body strength. 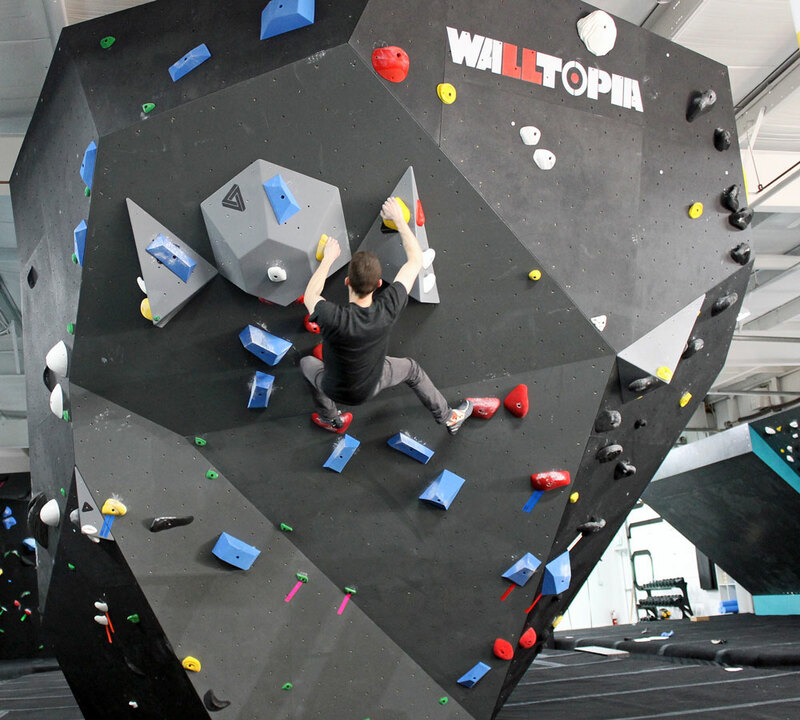 The co-owners have plans to make Bolder an extensive training facility for boulderers. 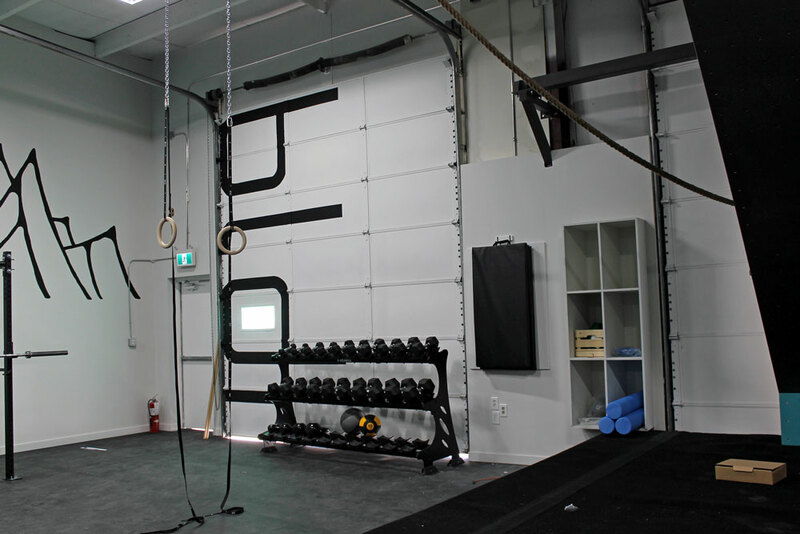 There are free weights and rings and hangboards (not pictured) that athletes can use to work on their strength. The check-in area – where you can also pay to rent shoes and a chalk bag – is shared with the cafe. Bolder Coffee Company coffee will be sold here, as well as hot chocolate. A few seats will be set up at the coffee bar, or if visitors just want to drink coffee and not climb, they can take their drink upstairs. These stairs take visitors up to the mezzanine, where there are couches, a rowing machine and lots of room for stretching. Visitors can also buy Bolder branded merchandise here. (All branding and merchandise was designed by the Bolder team.) 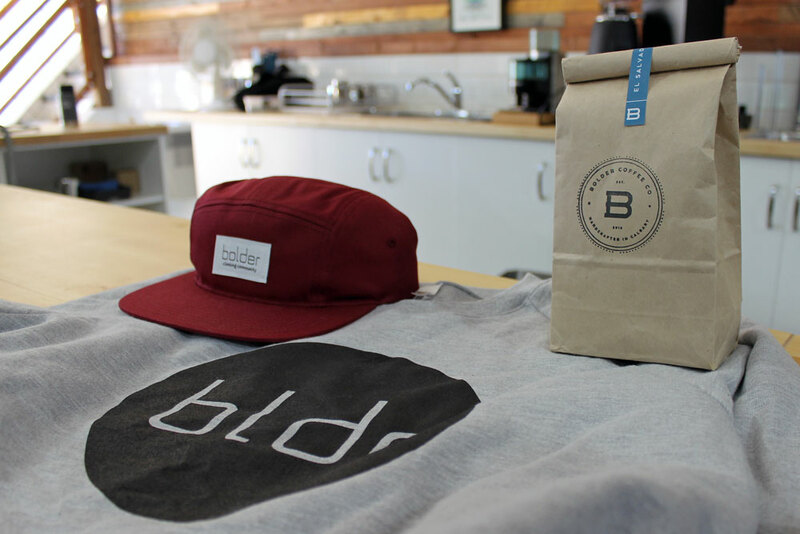 There are sweaters, hats, tank tops and T-shirts for sale, and you can also buy a bag of Bolder coffee beans. Bolder has big plans for the future. The team is hoping to put on special events like climbing competitions, DJ nights and maybe even costume competitions around Halloween. There’s a lot of lingo to learn when you enter the climbing world. The Bolder Climbing Community co-owners shared some terms that are good to know if you’re completely new to the world of bouldering. This is the information about the climb. It could include how difficult the route is and the sequence of holds. This is a very small, shallow hold that you will only be able to grip with your fingertips. When you finish a route in one go, without falling or starting over. This is the easiest hold in climbing. They’re deep and have lots of surface area, making them easy to grab. A hold that works best when it’s gripped with your fingers and thumb on either side of it. The creation of the climbing route. A technical hold with no sharp edges and that must be held with an open hand. When someone is on the ground and has their hands up, ready to support a climber in case they fall.